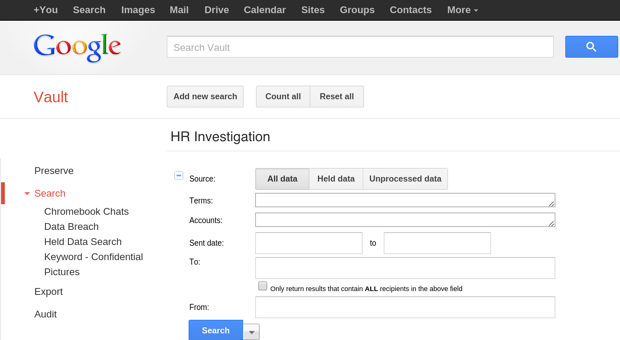 With Google Vault for Google Apps you can manage, retain, search and export your organization’s email, files (1) and chats. 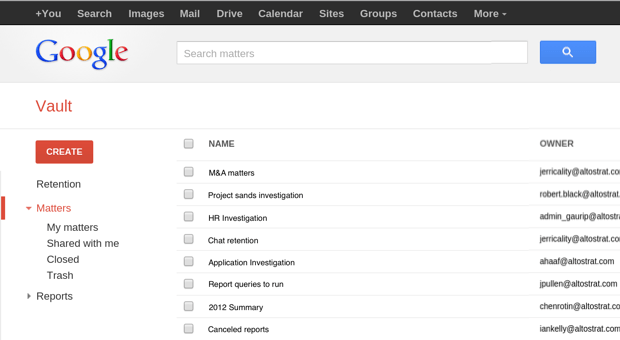 Be prepared for litigation and compliance audits with powerful search tools that help you find and retrieve relevant files, email and chat messages. Export specific files, email and chat messages to standard formats for additional processing and review. 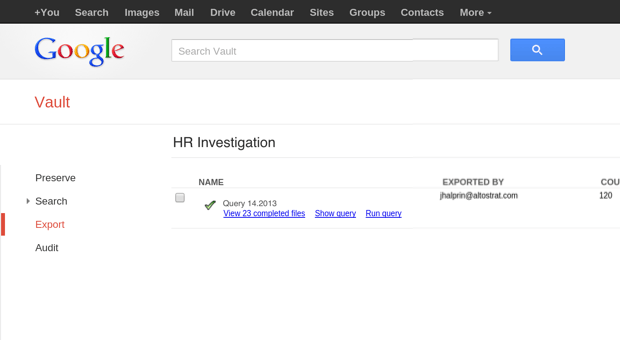 Google Apps Vault allows you to reduce risk and costs associated with litigation and compliance audits. For an additional small value per user per month, you can add capabilities that help your business be prepared for these situations. 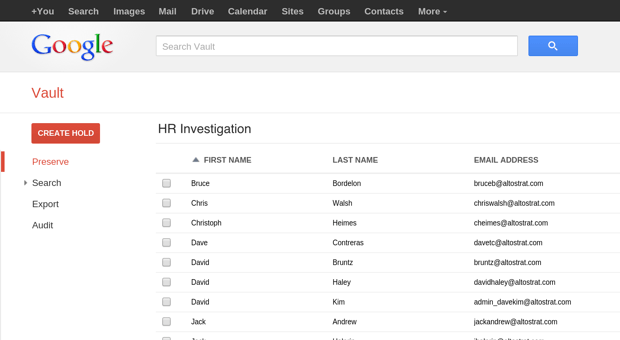 Google Apps Vault is designed for security and reliability with features like encrypted connections to Google’s servers, simultaneous replicated storage for your messages, built-in disaster recovery and sharing controls that let your users collaborate securely on matters. (1) Setting retention policies, creating holds, and conducting domain-wide searches for Drive content are not available at this time. Powerful archiving and eDiscovery for your business data at an affordable price. We are an experienced certified Google for Work Partner that can assure a smooth adoption of Google Apps and Google Vault by providing services at a competitive pricing. Choose us as your Google Vault partner wherever you are : Albania, Andorra, Angola, Armenia, Belarus, Belgique (Belgium), Bosnia and Herzegovina, Brazil, Bulgaria, Croatia, Czech Republic, Danmark, Deutschland (Germany), España (Spain), Estonia, Finland, France, Georgia, Greece, Green Cape Islands, Hungary, Ireland, Island, Italia (Italy), Latvia, Lithuania, Malta, Moldova, Mónaco, Mozambique, Nederland (Netherlands), Norge (Norway), Polska (Poland), Portugal, Romania, Russia, São Tomé e Princípe, Serbia, Slovakia, Slovenia, Suisse (Switzerland), Sverige (Sweden), Turkey, Ukraine, United Kingdom, …) and benefit from the experience of the cloud business solutions leader.